We've all seen the videos: paint wash water poured at curbside, or dumped into a storm drain, stream, lake, or ocean, causing harm to the surrounding area and its living creatures. Even when handled properly, disposing of wash water can be needlessly wasteful of a scarce resource. In support of our greener by design® philosophy of being as eco-efficient as possible, Dunn-Edwards has decided to become part of the solution by supporting new products that promote reducing and recycling of paint wash water. Consequently, Dunn-Edwards is now the exclusive West Coast pro paint distributor of the Envirosolutions™ Envirowash™ System. Whether or not you perceive your paint wash water as dangerous, the EPA regards it as an Industrial Waste Discharge that is subject to specific rules and regulations. Even if you are abiding by the rules, a great deal of water is being consumed and often wasted as a result of cleaning up paint application equipment and tools. Reclaiming the wash water can supply your sites with usable water, and mobile stations for cleanup. 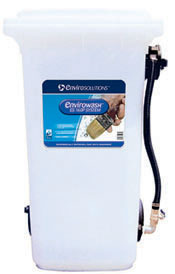 The Envirowash™ System is efficient and fast – separating paint solids from 40 gallons of water in as little as 2 hours. The largest system can handle up to 200 gallons of every type of water based acrylic paint. After cleaning up tools, when the Envirowash™ tanks are full of paint wash water, special detergent additives are used to separate the solid matter and water. The solids sink to the bottom of the tank over a period of 1 to 6 hours (depending on the size of the tank), leaving clear water that is ready for re-use at the top of the tank. The sediment at the bottom of the tank is filtered out, dried and disposed of as non-toxic waste. Every contractor knows that job sites can accumulate a great number of paint-laden brushes, rollers, and sprayer parts, so cleaning up at the end of the day and following environmental rules can be time consuming and costly. Safer and more cost effective solutions like the Envirowash™ System offer new and innovative solutions to a job's cleanup demands. Some residential painters in other countries charge the homeowner a fee to process the wash water. The fee both offsets the equipment and chemical costs and lets the customer know in the invoice that the wash water was handled responsibly. Learn more about the Envirosolutions™ Envirowash™ System.